The rules are pretty simple and can be found here. Since I've already got one book to movie book on my list for another challenge, I figured why not. 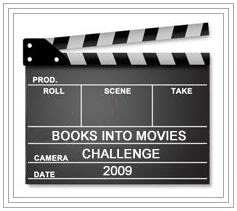 So my 2nd challenge for 2009 is to read 2+ books that have been or will be made into movies. edit 9-4: sure it sounds easy but I've finally read a book that was made into a movie - Bridge to Terabithia!